The character of the opposition which some of these papers have met with suggests the inference that they contain really important, but unwelcome truths. Negatives multiplied into each other change their sign and become positives. Hostile criticisms meeting together are often equivalent to praise, and the square of fault-finding turns out to be the same thing as eulogy. But a writer has rarely so many enemies as it pleases him to believe. Self-love leads us to overrate the numbers of our negative constituency. The larger portion of my limited circle of readers must be quite indifferent to, if not ignorant of, the adverse opinions which have been expressed or recorded concerning any of these Addresses or Essays now submitted to their own judgment. It is proper, however, to inform them, that some of the positions maintained in these pages have been unsparingly attacked, with various degrees of ability, scholarship, and good-breeding. The tone of criticism naturally changes with local conditions in different parts of a country extended like our own, so that it is one of the most convenient gauges of the partial movements in the direction of civilization. It is satisfactory to add, that the views assailed have also been unflinchingly defended by unsought champions, among the ablest of whom it is pleasant to mention, at this moment of political alienation, the Editor of the Charleston Medical Journal. "Currents and Counter-Currents" was written and delivered as an Oration, a florid rhetorical composition, expressly intended to secure the attention of an audience not easy to hold as listeners. It succeeded in doing this, and also in being as curiously misunderstood and misrepresented as if it had been a political harangue. This gave it more local notoriety than it might otherwise have attained, so that, as I learn, one ingenious person made use of its title as an advertisement to a production of his own. The commonest mode of misrepresentation was this: qualified propositions, the whole meaning of which depended on the qualifications, were stripped of these and taken as absolute. Thus, the attempt to establish a presumption against giving poisons to sick persons was considered as equivalent to condemning the use of these substances. 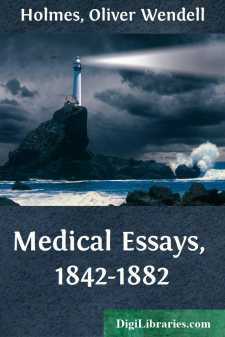 The only important inference the writer has been able to draw from the greater number of the refutations of his opinions which have been kindly sent him, is that the preliminary education of the Medical Profession is not always what it ought to be.